Hey June- it's so good to see you! May was a great month- full of celebrations, sun and even some goodbyes. It's a new month, new start though and so let's see how I did during the month of March. For teacher appreciation week- we went simple because 1) time 2)forgetfulness and we went with a bag of chocolates for each teacher and a sweet note from Sophia. For end of the year gifts, I got inspiration here. 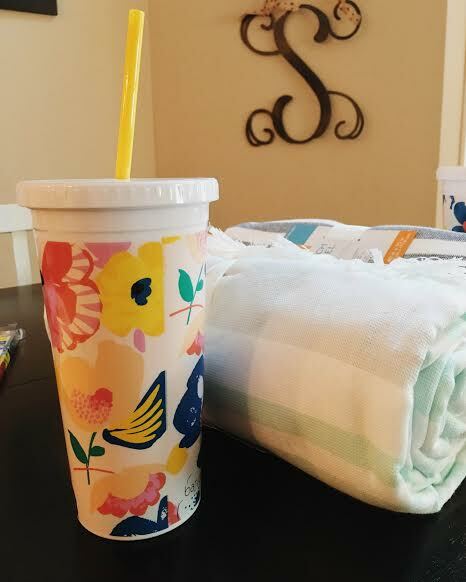 I also got these cute tumblers from Nordstrom but they must be all sold out because I can't find them! =( I am also going to get a magazine, fingernail polish and probably lip gloss/EOS chapstick and either wrap it all up and tie a ribbon on it or find a cheap, cute tote bag to put it all in. Were a success! We're so excited to see the photos! Ok- a little bit of slack here- I hope to complete this goal this weekend! I didn't do so great guys. I was more mindful of purchases and refrained from impulse buying- Hello Nordstrom Half Year sale- I'm looking at you! But with end of year gifts, graduation gifts, I definitely didn't hit my goal of not spending anything. Now, onto this month's goals! I've had "organize" on my goal list for a few months now. But I didn't exactly have a plan to really bring this goal to fruition. And we all know that a goal without a plan is just a wish. And that's what I have- a perfect wish but no way to actually make it happen. So, I've decided to make a plan people. My first plan is to organize the fridge/pantry. I found these containers at Ikea but I am also going to hit up good old Dollar General and see what storage containers they have. Next month, will be a new area. Last year, we created a family summer bucket list- it's that time again! Look back here Friday for the Scholtes Family Summer of FUN list! It's a little over a month before our big trip to Italy. It's going to be that time where I bust out my notebook and pen and start my packing list. Unfortunately for Will, he is getting stuff for Italy for Father's Day. He needs some new shoes and needs a bag for Italy that is light, easy to squish into small spaces (small cars, people) and that is also big enough, but not too big. I plan to bring my Vera Bradley duffel which is the perfect size, but Will isn't too keen on the bright prints. So, we're on a hunt for something similar for him, minus the patterns. =). I'm sure most of my stress surrounding leaving for Italy would be lessened if I wasn't so anxious about leaving the girls for 10 days. We went to Jamaica two years ago and I created lists of meal ideas, activities they could do while we were gone and of course, the important stuff like doctor's numbers and insurance information. I'm sure that since we're leaving for longer and going further, my list making will be on overdrive. So, there you have it! Let's see how I do! I will try to remember to post updates once I have the pantry all organized for you all! Also, don't forget- follow me here on Instagram and Snapchat- Sscholtes. I tend to post more (daily) than I do Facebook but be sure to check out that page too!